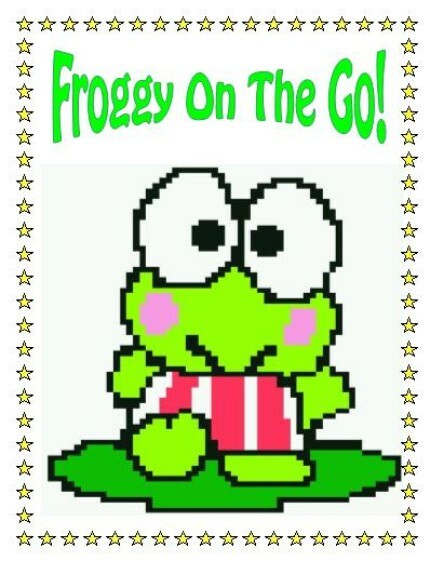 Froggy On The Go! in CROSS STITCH!! We used to do the cross stitch on both rolls of plastic canvas (children love doing this one) that was 10-mesh to the inch and also on 14 count Aida cloth for smaller projects. The Cross Stitch graph measures 56st wide x 51st high. The kids loved Froggy!! He's marching into spring and will also march right into your heart. You will receive the download URL upon receipt of Cleared payment. These are electronic files. **Cross Stitch .pat files requires the HobbyWare program. **Cross Stitch Graphs - these are the graphs only, no written instructions. Please feel free to use the patterns for constructing craft items for sale at craft shows or any online venue. No mass production, though. Please note my copyright below and contact me for any clarification. All of these patterns / designs / techniques are copyrighted to MKDesigner. I wrote / designed them, I own them. Simple.